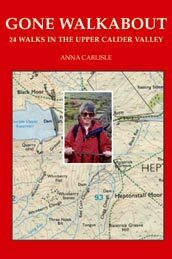 Gone Walkabout: 24 Walks in Upper Calder Valley - Anna Carlisle','First having appeared in the Hebden Bridge Times and Todmorden News, the twenty-four walks featured in this book are designed, firstly, to have any sedentary Calder Valley dwellers haul themselves up out of their armchairs and onto their own beautiful 'tops' so Close to Home - and secondly, to take the more serious walking enthusiast 'Further Afield' and onto the remotest western reaches of our county - and even into the neighbouring one. These walks are designed for the moderately and for the supremely fit, and they are graded according to distance and degree of difficulty. Used as a handbook both to guide our routes and to continue to inspire walking incentives, Gone Walkabout will have almost all of us savouring to the full the stunning and historic fells, crags, woodlands and moorlands of Far-West Yorkshire.